An individual’s genome is the full complement of genetic information inherited from its parents. Within this vast repertoire of genetic information, individual genes are being discovered that control critical production and fruit quality traits. As valuable rosaceous gene discoveries are made and put into breeding applications, RosBREED describes them as “Jewels in the Genome” (Iezzoni, 2010). The Ma locus is selected as one of RosBREED’s “Jewels in the Genome,” because the Ma locus simultaneously provides predictions for three high priority traits: acidity, crispness, and juiciness. Identification of Ma locus alleles allows breeders to make desirable parental combinations and select seedlings with superior performance prior to field planting. Crisp, juicy apples with pleasing acidity are highly desirable for the fresh market. However, obtaining the optimum combination of these desirable textural and taste attributes has been challenging. Soft, mealy, poor tasting apples frequently occur in breeding populations. A region on linkage group (LG) 16 contains gene(s) that influence apple crispness and juiciness (King et al. 2001). Figure 1. Evaluating crispness with a Mohr Digi-Test. Photo credit: Kate Evans, Washington State University. Iezzoni, A. 2010. Jewels in the Genome. RosBREED Newsletter 1(1): 9. (http://rosbreed.s3.amazonaws.com/wp-content/uploads/2010/10/2010-02_RosBREED.Newsletter.pdf) (verified 12 Dec 2012). King G.J., Lynn J.R., Dover C.J., Evans K.M., and G.B. Seymour. 2001. 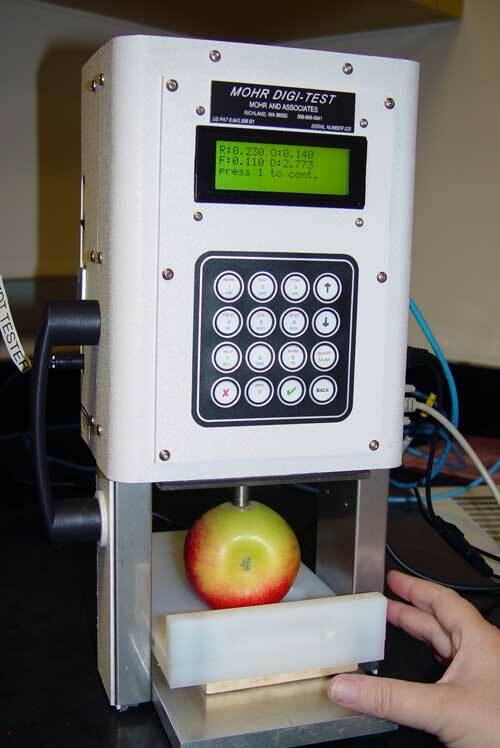 Resolution of quantitative trait loci for mechanical measures accounting for genetic variation in fruit texture of apple (Malus pumila Mill.). Theoretical and Applied Genetics 101: 1227-1235. Maliepaard C., Alston F.H., van Arkel G., Brown L.M., Chevreau E., Dunemann F., Evans K.M., Gardiner S., Guilford P., van Heusden AW, Janse J, Laurens F, Lynn JR, Manganaris AG, den Nijs APM, Periam N, Rikkerink E, Roche P, Ryder C, Sansavini S., Schmidt H., Tartarini S., Verhaegh J.J., Vrielink-van Ginkel M., and G.J. King. 1998. Aligning male and female linkage maps of apple (Malus pumila Mill.) using multi-allelic markers. Theoretical and Applied Genetics 97: 60-73. Development of this page was supported in part by the USDA's National Institute of Food and Agriculture (NIFA). Project title: RosBREED: Enabling marker-assisted breeding in Rosaceae is provided by the Specialty Crops Research Initiative Competitive Grant 2009-51181-05808. Any opinions, findings, conclusions, or recommendations expressed in this publication are those of the author(s)and do not necessarily reflect the view of the United States Department of Agriculture.